It's Halloween at The Holiday Hotel! 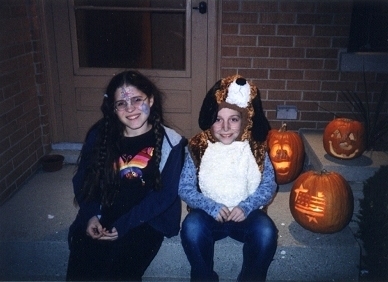 Sarah and Emily on Halloween night 2002. 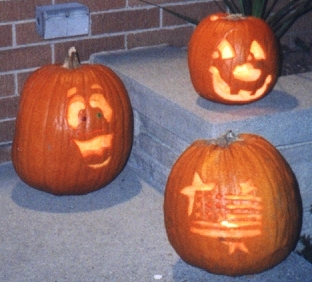 10-27-02 - Every year, we look forward to getting our pumpkins and carving them! We are going to be doing that today! We already have our pumpkins. Also, Emily is going to be a dog and Sarah is going to be a hippy for this year's Halloween! Wow, looks like we need a new Halloween picture! Will have to get one this year! Here is my first ever adoptable! If you would like it personalized, just send me an email with the information. I will try to get back to you as soon as possible. Awards and Gifts I Have Been Given! Look what I got from my 2002 pumpkin pal!! Thanks, Dixie Witch!